Solid cold cast bronze guardian angel warrior. Field commander of the Army of God. 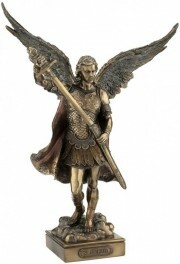 Includes a collector's tag with extra info about Archangel Michael. Micheal means Who is like God. Often shown stepping on the neck of Lucifer, or the dragon.